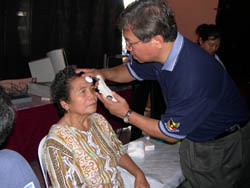 The Eye Team from the Kuching Sarawak General Hospital (SGH) visited Bau on the invitation of the Kuching Lion's Club last Sunday (19/03/2006) to perform community eye screening. 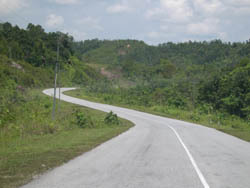 Bau is a town 37 Km East of Kuching and the journey took about an hour from the hospital. The town has no ophthalmic services of its own. 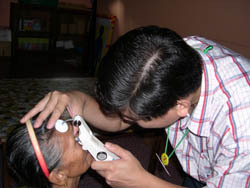 In this visit, we screened 150 patients for glaucoma and also saw patients with a variety of ocular complaints. 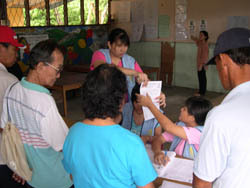 Patients who needed further management were given appointments to attend the Eye Department in SGH. 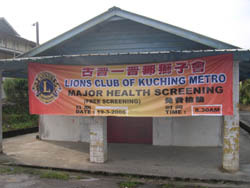 The Screening Centre and the Lion's Club banner. 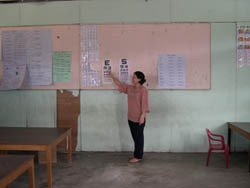 Staff nurse performing Snellen vision test. Dr. Tan and Dr. Faisal checking instruments. 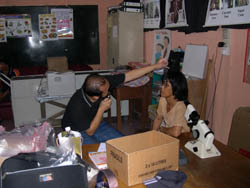 Dr. Tan checking a patient's IOP. Dr. Intan doing the Perkin. 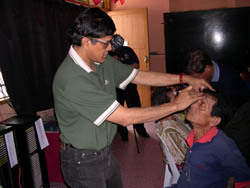 Dr. Faisal performing binocular ophthalmoscopy. Nurse Dorin and Dr. Intan taking a break. The country road that took us home.